Proof once again that a British cup game tops the lot. Guts, more mud than the Somme, comedy goals, kamikaze tackles, a no-nonsense ref who looked like he fancied a fight, dreadful misses galore, it could have finished 7-7. 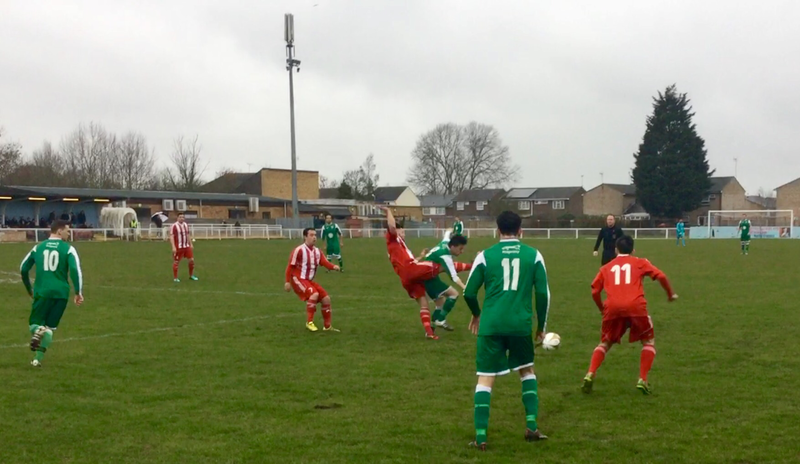 Remarkable that amateurs in an FA Vase quarter final can produce such a spectacle – not in a footballing sense – the pitch didn’t allow for that – but up there with the best soccer thrillers. A stupendous game, even better than watching Wales. 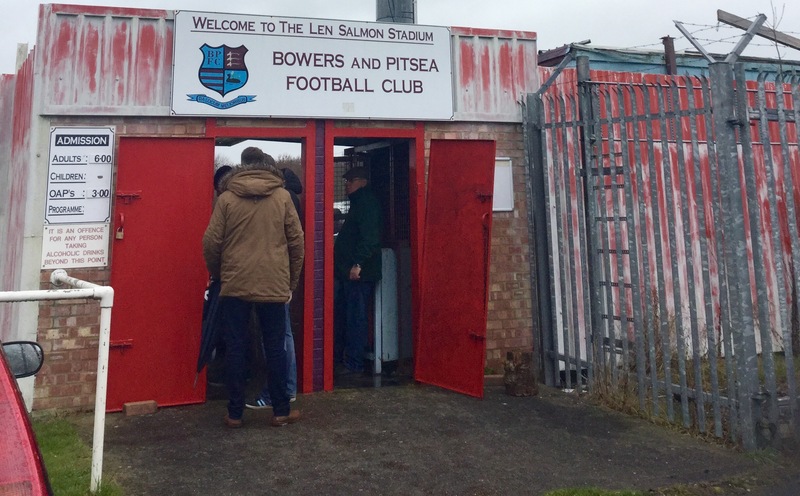 Bowers and Pitsea – you might even call it East Basildon, have still still got 20 Essex Senior League games to play league by April 23 and they’re going to be very tired by the end of the season. They play at the Len Salmon stadium on the edge of one of the county’s seemingly endless sprawling suburbs A boggy pitch resembling the tar sands of Canada meant they had to play a home game at Canvey Island in midweek and, on arrival, crowd barriers and a tarpaulin covered a patch of one penalty area. One end has nothing behind it, the other seems to have a string of shipping containers joined together, decked out in an anaemic pale blue paint which is peeling – more of that later. 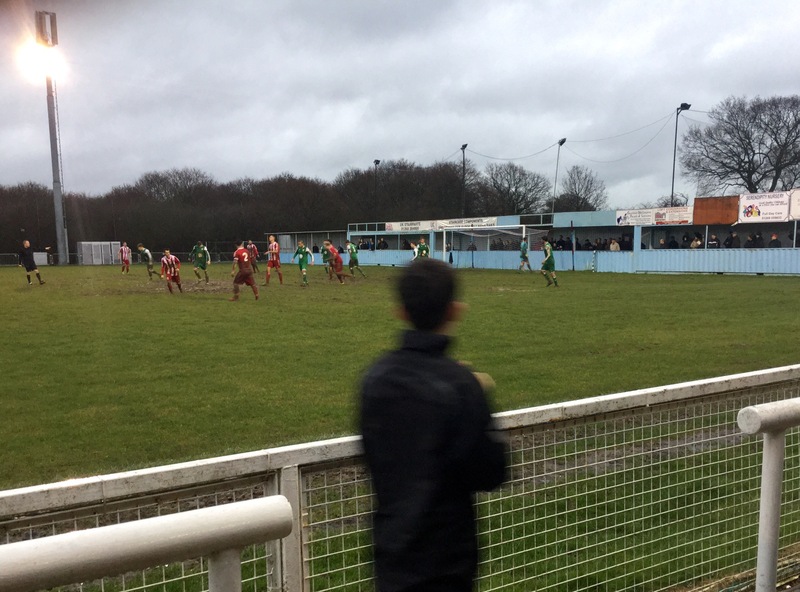 There was a refreshing 80s feel about the grey, the drizzle, the swampy pitch and yes, you guessed,the teams came out to the clunking clodhopper of a cliche, Eye of the Tiger. Keen to get a move on, the match started before 3pm as perhaps the match officials were anxious to be back for the new series of Ant and Dec on ITV. 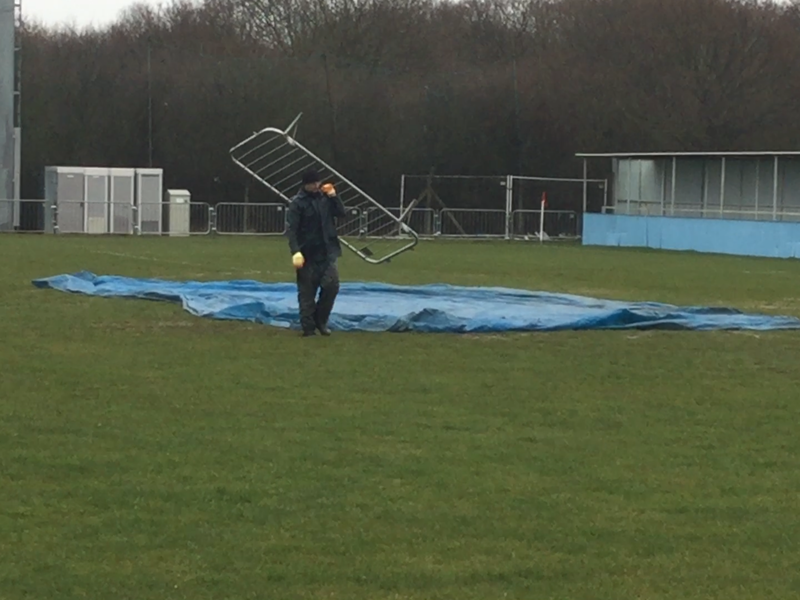 If they didn’t fancy their own pitch after only two minutes it got worse for Bowers and Pitsea. Keeper Martyn Guest saved well only for striker Kristian Thomas to grab the rebound and try an audacious shot from a van Basten v Russia angle in 1988 to go in at the near post off the keeper. Ten minutes later, the fluke goal of the season – one of the visitors blasted a loose ball from ten yards out straight on to the shin of Thomas and it rebounded into the net with the striker barely knowing and contributing nothing to the goal. 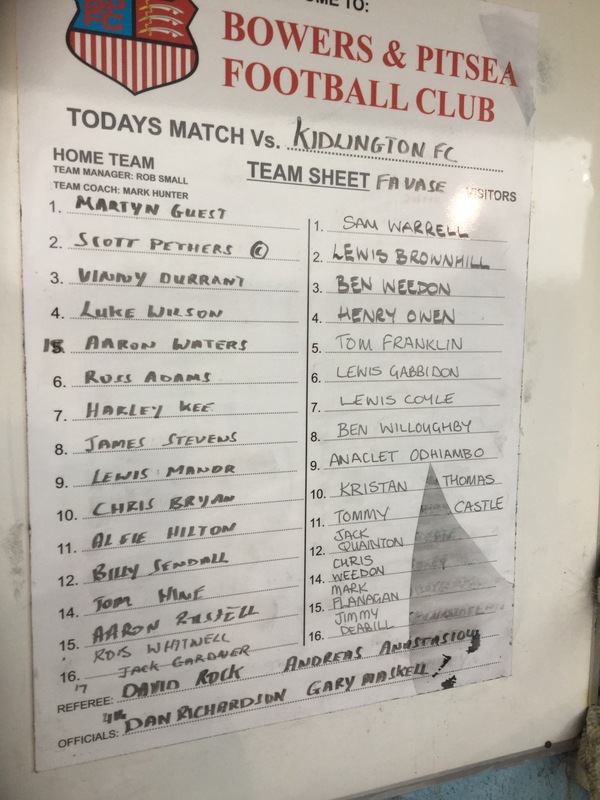 It looked like it might be five or six-nil as BP were torn to Shredded Wheat down the boggy left wing at will – Hellenic Premier League side Kidlington using long balls to free No 11 Tommy Castle and speedy striker Anaclet Odhiambo. Against the run of play BP pulled a goal back through Alfie Hilton, who netted as he controlled a shot from James Stevens which was going wide -and that was with barely 15 minutes gone. In retrospect that was a key point as BP were able to regroup after looking as swamped as some of the flanks of the pitch. Even then they needed more luck. More elusive stuff down the left wing saw Castle storm the home ramparts to squeeze the ball over the line for a visitors’ third. Only it didn’t count. Those behind the goal saw it clearly but the ref didn’t and the lino hadn’t kept up with the the pace of play and couldn’t give it. All free-flowing stuff so far, given the sticky pud surface. No aggro either, “Get out of ma face,” the ref snarled at home centre half Aaron Waters as appeals and moaning got no sympathy, even when some muscular stuff was dished out. Great name for a ref too – David Rock. A man seemingly defined by his name. Guest collided with the post making a splendid save to deny Thomas’s header, which would have given the striker a hat-trick and Lewis Coyle almost caught him out with a shot from 40 yards out that only just missed. Half time came, together with the realisation that the water had diluted the paint in the covered end – I’d been leaning against barriers which were coming off on my brand new Debenhams sale bargain .Cue 15 minutes – the entirety of half time – in the loo trying to scrub it all off with toilet paper. BP drew level via a James Stevens free kick which Sam Warrell could only parry into the net, after 50 minutes. Then it was comedy goal alert, Kidlington’s defence sliced a clearance on the edge of the six-yard box for Lewis Manor to score easily. 2-0 down in 12 minutes, Bowers were now 3-2 up. More relentless attacking, daredevilry, inswinging corners that were nearly goals in themselves, a couple of dreadful tackles but Mr Rock – I bet everyone calls him that and not ‘Dave’ – seemed to be enjoying most of them and kept play going. And that was just 90 minutes. In the Vase you get extra time so there were even more crazy antics coming right up – goal-line clearances, crosses only atoms away from connecting with a goal-winning boot. And to top it all, it was put on a plate for Odhiambo to head a winner – it’s on the vid – and he fluffed it – not his first fluff of the day either. Miss of the season in what for me was game of the season. Goalie Guest man of the match for BP, closely followed by lunging centre half Luke Wilson. 3-3 bout right then – no one deserved to cop a defeat today but nemesis is nigh for one of these plucky sides. Bravo to all. Next Saturday’s replay in Oxfordshire surely can’t be as good as this.